Alfred Nathan Sibley was the second son of George & Harriet Sibley, one of six boys and two girls in the family1. He was one of those quietly heroic characters who answered his country's call, at the word of command, he would follow the colours irrespective of self and sacrifice. He attended the Church Street Schools and did not have to travel far for his evening classes and entertainment with his pals in the Boys Brigade2. He was a member of the Primitive Methodist Church on Wollaton Road and resided near the church at 10 Wilkinson Avenue. It was often emphasised in the Great War that the influence of religion was to produce fortitude, tenacity and courage. Whatever the motivation, Alfred enlisted in 2nd/7th Battalion Sherwood Foresters, early in the War, on 30th October, 1914, at Nottingham. He stated that he was employed as a fettler3. The 2nd/7th Battalion Sherwood Foresters which had been raised during the Boer War, was abolished when the Territorial Forces Act came into force in April 1908, and consequently when the Great War broke out there was only one Battalion, and this became the 7th Battalion Sherwood Foresters known locally as the "Robin Hoods". Orders were received soon after the outbreak of war that Second Line Battalions were to reform as a reserve and to reinforce the first line casualties when necessary. The North Midland Division was thus formed in late August 1914, with the 178th Infantry Brigade becoming part of the Division comprising the 5th, 6th, 7th and 8th second line battalions of the Sherwood Foresters. The first new recruit for the 2nd/7th Battalion was enlisted on 14th September 1914. After raising the second line battalions the men were billeted in Nottingham and surrounds, with the local lads in their homes until the end of January 1915. Training was limited to drill, and elementary tactical exercises. On the 30th January 1915 orders were received that the 178th Brigade was to proceed to it's War Station at Luton in Bedfordshire. After arriving in the grounds of Luton Hoo the battalion took part in more advance training and took part in Brigade operations with a lot of route marches. Training continued throughout the year and on 27th June "A" Company left as a complete draft to the First Line to France. Until the end of January 1916, drafts amounting to two Officers and 169 N.C.Os. and men where sent to fill vacancies in the first Line battalion, men with previous experience being selected where possible. Ireland and Home Rule - In August 1914 the political controversy of "Home Rule" for Ireland was put aside when the Great War overshadowed all differences between politicians, resulting in over 250,000 Irishmen of whatever belief pledging their allegiance to the Crown and the cause of patriotism. With the increasing food shortage however the country districts prospered but in the towns the story was very different. The city of Dublin in particular felt the pinch of poverty, the price of food and products were ever increasing but with pre-war rates of pay for the workers, seeds of rebellion could be found. This was the situation then in 1916 when a number of intellectuals launched the idea that the time was right to strike a blow for autonomy. With the help of American money, arms were purchases from Europe and landed on the Irish Coast. On Easter Monday when many British Army Officers were absent many attending a local horse race meeting and the troops stationed there were enjoying time off, a force of some three thousand or less took this opportunity to strike. The first shot fired by the rebels was outside Dublin Castle when a policeman was killed and this incident sparked off the rebellion. Other places of strategic importance seized by the rebels were St.Stephen’s Green an ornamental park near the centre of the city, which dominated extensive road, communications. The adjacent building of Jacob's Biscuit factory, and nearest the river Boland's Mills. One of the most important places to be taken by the insurgents was Trinity College, commanding a strategic position overlooking the city. The General Post Office in Sackville Street was taken by a large force, which expelled all staff although some were in league with the rebels. It was from the Post Office that Patrick Pearce the insurgents leader, a headmaster from St. Edna's School, stood on the building steps and declared an independent Irish Republic. It was in this building that the rebel force established their military headquarters. And so began the 2nd /7th "Sherwoods" involvement as part of the 178th North Midland Brigade in the Irish Rebelion which resulted in 23 deaths from the Brigade. The reinforcements summoned from England were the two Infantry Brigades the 176th 178th part of the 59th North Midland Division. The Brigades left Watford by train where they finally arrived on the Prince's Landing stage in Liverpool The troops boarded the S.S. Tynwald which sailed at 8pm on Tuesday 25th April 1916. They had lost one of their four Lewis Guns in the process of embarkation in Liverpool but more of a nightmare, as proved later however, was the loss of grenades which had been left behind back in Watford. It became known on embarkation that the destination was Kingston in Ireland, the port being reached about 4am on Wednesday 26th. For some reason, probably the difficulty in obtaining shipping occupation, the first line transport and Lewis guns were detained in Liverpool and on arrival at Kingston the only arms in possession of the battalions consisted of rifles and bayonets, which proved to be a problem in the coming hours. It was learned by the troops, on arrival at Kingston, that a rebellion had broken out in Dublin, and that the rebels were holding many of the principle buildings, with a view of preventing any soldiers from entering the city. The 178th Brigade were to move towards Dublin in two parallel columns each along the two roads closest to the coast. The starting point of the advance was to begin from Kingston harbour at 10.35. The Brigade moved as ordered in two columns of two battalions each along the two roads, closest to the coast. It was a fine spring day. The inland force comprised the 2nd/5th and 2nd/6th battalions of Sherwood Foresters which reached Kilmainham and Kingsbridge without opposition; not so the 2nd/7th & 2nd/8th, continuing on the road towards Beggars Bush Barracks. It was after they had past Beggars Bush and were on the way aiming to reach their first objective, Trinity Collage, that the vanguard of the 2nd/7th ran into enemy fire at the corner of Haddington and Northumberland Roads. Based in No 25 Northumberland Road were Mark Malone and Seumas Grace of the 3rd Battalion Dublin Brigade. They opened fire and the effect was devastating to the 2nd/7th, walking up the road in column of fours with their officers out in front. All the troops hit the ground while they tried to locate the source of the firing. Malone was a crack shot with the Mauser automatic and his position in the bathroom at the side of the house was brilliantly chosen. The shots from this property and also from Clanwilliam House, a substantial Victorian town house block facing across Mount Street Bridge with a clear view down Northampton Road, totally confused the columns of soldiers. As they tried to crawl en mass towards the building they believed the local schools to be their objective, they presented an almost immobile target. Captain Dietrichsen the Adjutant of the 2nd/7th, until recently a lawyer in Nottingham, who tried to get the squad to move was instantly shot down. Captain Dietrichsen had recently moved his wife and family from Nottingham to Ireland to escape enemy bombing from the German "Zeppelins". It was during this encounter that most of 2nd/7th casualties occurred, among the officers and men killed were Privates Dixon and Sibley from Beeston. Both are buried close to each other in Grangegorman Military Cemetery. 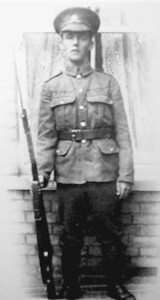 Alfred Nathan Sibley was the 6th member of the Beeston Old boys to make the Supreme Sacrifice. The persistent shortage of grenades was eventually remedied around 5pm No 25 and the schools were finally rushed and carried by grenade assaults and a supply of fresh troops, the 2nd/8th which were brought through to relieve the exhausted and demoralized 2nd/7th. Malone was killed sometime around after 5pm, but even in the thick of a full scale attack Grace was able to make his escape from the back of No 25. He was eventually captured on Thursday in an outhouse in Haddington Road, after the owner informed the army. 1At the time of the 1901 Census, the family was living at 9 New Street, Draycott, Derbyshire (Piece 3212 Folio 13, Draycott, Derbys). George Sibley was working as a lace maker and was recorded as born in Sneinton, Nottingham in about 1869; his wife Harriet was shown as born about 1872 in Carlton Scrope, Lincolnshire. It seems that residence in Draycott was only for a short time as their five children recorded at that time (including Alfred N, age 7) were each born in Beeston and the family moved back to Beeston and were living at 10 Wilkinson Avenue, Beeston, at least by 1909. The family, now including eight children, were there at the time of the 1911 census. Harriet Sibley died in 1914, just after the outbreak of war, aged 42. Alfred was then working as a brickyard labourer. 2Alfred Nathan Sibley is known to have joined the Boys' Brigade in Beeston on 1st November 1909, then aged 15 and working for Mr Moore. 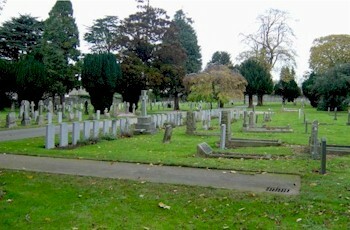 5Many casualties are recorded in the records of the Commonwealth War Graves Commission with initals only. Where the full name is known from other sources, this has been added here and elsewhere.